What is the ACL and how can it be injured? Ligaments are tough, non-stretchable fibers that hold your bones together. The ACL, or anterior cruciate ligament, is one of four primary ligaments that connect the femur (thigh bone) to the tibia (shin bone) at the knee. The ACL’s position — running diagonally through the center of the knee — enables the ligament to provide stability to the knee, limiting side-to-side rotation and preventing the tibia from moving ahead of the femur. 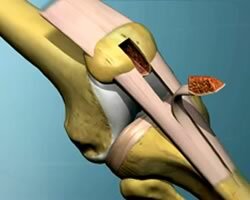 Along with ligaments, the knee also contains a cushion of articular cartilage that caps the ends of each leg bone, as well as additional shock-absorbing cartilage, called the meniscus, between them. Injury to the ACL is one of the most common knee ligament injuries. Even though most ACL injuries occur during a sports activity, ACL injuries aren’t just caused by being tackled while playing football. Injury results when the ACL is stretched beyond its limit. You may have injured your ACL by pivoting quickly, landing poorly from a jump or by hyperextending your knee. You may have heard a popping sound when your injury first occurred. After that, severe pain and severe swelling of the entire knee probably sent you right to your doctor or emergency room. Other symptoms include an inability to move your knee normally, or walk without pain or a feeling of instability. In order to diagnose you properly, your doctor will consider your symptoms, ask you about your activity leading up to the injury, and examine your knee carefully. Because half of all ACL injuries are also accompanied by injuries to the other soft tissue in the knee, your doctor will want to look at the big picture. In addition to examining your knee in specific positions and manipulating its movement, your doctor will likely want you to have X-rays (to check for fractures) or an MRI (magnetic resonance imaging).